Mary and her sister, Martha, went to school at Roe Head, Mirfield, where in 1831 Mary met Ellen Nussey and Charlotte Brontë and they became great friends. Mary and Charlotte both stayed in each others homes regularly. Charlotte used the Taylor family as the model for the Yorke family in her novel Shirley, describing them as ‘peculiar, racy, vigorous; of good blood and strong brain; turbulent somewhat in the pride of their strength, and intractable in the force of their native powers’. Mary seems to have been an independent, blunt, hard-headed, clear thinking person, and very much Charlotte’s intellectual equal. However, financial difficulties meant that Mary put her energy into working, and developed a very clear understanding of the importance of work to any woman, regardless of financial need, something that she and Charlotte did not quite agree on. more energy and power in her nature than any ten men. To me it is something as if a great planet fell out of the sky. They never saw each other again, although they corresponded until Charlotte’s death. Mary built a house which she let out, and taught piano. Charlotte was anxious about Mary’s financial situation and sent her £10, which Mary used to buy a cow. She bought other cattle with money from her brothers, and started writing, although nothing seems to have been published until many years later. In 1849 Mary was joined by her cousin Ellen Taylor and together they built a house and opened a draper’s shop. Mary, by all accounts, loved everything about keeping shop, from the manual labour to the financial independence. Ellen died of tuberculosis in 1851. Mary threw her energies into the shop and it was a great success, until trade fell off in 1858 at which point Mary decided to return to Yorkshire. Between 1865 and 1870 she published a series of feminist articles in the Victoria Magazine, In 1870 the articles were collected and published as a book, The first duty of women. The first duty – is for every woman to protect herself from the danger of being forced to marry. 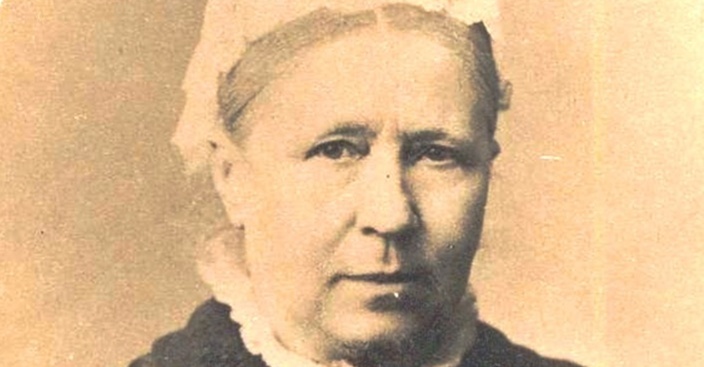 This entry was posted in feminist, history, Lesbian, The Historical Birthday-Tea Party and tagged Charlotte Brontë, Ellen Nussey, Feminist, lesbian history, Mary Taylor by Cherry Potts. Bookmark the permalink. What a sensible woman! Welcome to tea at any time.